Put your best face forward with one of Haven's extraordinary facial therapies. Our experienced estheticians, combined with the best products and cutting-edge technologies, bring out the radiant skin we all want to show! All therapies are customizable to your skin type and needs. Don't know which one to pick? No problem. Our team is happy to provide complimentary consultations! This resurfacing facial uses medical-grade therapeutic masques and anti-inflammatory botanicals to clear skin, minimize pores, reduce fine lines, smooth, soften and encourage skin renewal. Completely pampering and thoroughly rebalancing, this combination of our deep-pore cleansing Remedy and For Your Eyes Only™ facial therapies will leave you glowing and in seventh heaven. Actions: Exfoliates, hydrates, cleans pores, promotes lymphatic drainage, stimulates circulation, brightens, nourishes, boosts cell turnover. Haven's personalized maintenance facial. Best performed once every 4 to 6 weeks. Get your skin back under control with manual and chemical exfoliation, including a personalized acid peel. Stimulate cell renewal and resurface your skin. Diamond peel technology combines with a customized acid that addresses a variety of skin woes including anti-aging, hyperpigmentation and acne. Your skin will be smooth and radiant! Can be scheduled only under the direction of a Haven esthetician and after an initial Boot Camp™ facial. Increased frequency of this treatment in a close time frame is the most aggressive way to address any skincare concern. Using aromatherapy and three specific massage techniques, this facial focuses on the fragile skin around the eyes to treat fine expression lines, puffiness, dark circles, and muscle fatigue. Look 10 years younger without needles or surgery! The specially designed massage technique in this facial activates unused facial muscles, sculpts the face, and increases muscle tone. The specially blended enzymes, peptides and anti-aging serums will stimulate cell turnover, and collagen and elastin production. Results last for up to 2 weeks! Our organic rejuvenating facial can stop the clock by stimulating the natural production of collagen, regenerating fragile tissue, reducing visible lines, and firming contours. This organic facial specifically designed for acneic skin, will purify and resurface your skin by thoroughly extracting clogged pores and using customized products that incorporate enzyme technology. This mini facial offers no extractions so it is ideal for an instant glow before a special occasion. When all you need are some basics - light extractions and a little TLC. Effective for all skin types and provides immediate results without discomfort or downtime. This treatment is recommended for all skin types and targets skin issues such as fine lines and wrinkles, oily or congested skin, sun damage and uneven skin tone, and dry or dehydrated skin. The HydraFacial™ combines cleansing, exfoliation, extraction, and hydration all while delivering anti-oxidants, Hyaluronic Acid, peptides, and other essential nutrients. All of the benefits of our HydraFacial™ with additional elements of a classic facial for an extended therapeutic and luxurious experience. Gentle epidermal abrasion that can effectively treat sun-damaged skin, fine lines and wrinkles, enlarged pores, superficial scars, uneven granular skin, blackheads, and comedones. Aggressively works on lines, scarring and hyperpigmentation using a multiple step exfoliation process. 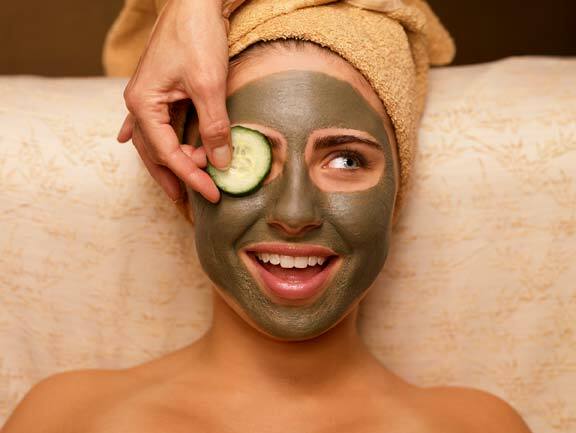 Can be scheduled only under the direction of a Haven esthetician. This grooming facial cleans, detoxifies, and perfects skin. Recommended for monthly maintenance. Serious about getting your skin in gear? This high performance treatment uses customized acids to deep-clean, hydrate, resurface, purify and protect skin. Effectively addresses ingrowns, breakouts, light scarring, sun damaged skin, fine lines and wrinkles, enlarged pores, uneven granular skin, and blackheads. Add something wonderful to your facial! Replace your classic facial massage with Haven's specialized muscle-toning and lifting treatment. Saturate your skin with a powerful dose of antioxidants. This mask will infuse your skin with professional strength Vitamin C for lasting reparative action and a protection boost prior to prolonged sun exposure. Take care of this important extension of your face. Nourish, hydrate and firm with a customized mask. This deep pore cleansing treatment used manual and chemical exfoliation to smooth scars, even out discoloration and treat breakouts. Finally clear your bikini area of ingrowns. In this treatment, we will gently cleanse the area with a special exfoliating AHA scrub, followed by an expert application of an acid peel to help free those trapped hairs and blocked pores. May light discoloration. Gently and effectively treat ingrowns and blocked pores on the sensitive skin under your arms. After a gently cleansing with an exfoliating AHA scrub, our experts will apply a customized acid peel to help clear those unbecoming bumps.